Monetary incentives are not always the most cost-effective way to make employees more productive. Three recent IZA World of Labor articles look at alternative mechanisms to improve worker productivity and boost firm performance: peer effects, employee well-being, and employee ownership. 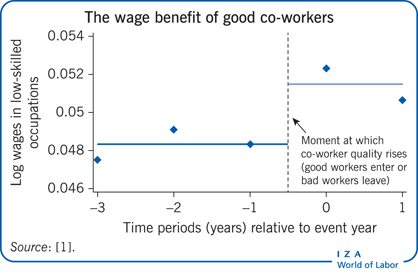 Should one expect a worker’s productivity, and thus wage, to depend on the productivity of their co-workers in the same workplace, even if the workers carry out completely independent tasks and do not engage in team work? Thomas Cornelissen (University of York & IZA) argues that this may well be the case because social interaction among co-workers can boost productivity through knowledge spillover or peer pressure. Cornelissen points at one of the downsides of the trend towards alternative workplace arrangements: Due to positive peer effects, the total productivity of the workforce is higher when workers are working together within the firm rather than from home. It would thus be beneficial for the firm to create spaces and occasions for social interaction and communication (to facilitate knowledge spillover), and to disseminate information about own and co-worker productivity (to facilitate peer pressure). Knowledge spillovers seem to be most relevant in situations when newly trained and untrained workers interact, in collaborative team settings, or between senior and junior workers. In such instances, Cornelissen recommends that firms encourage social interaction. Peer pressure, on the other hand, can help mitigate free-rider problems in teams, but in excess it can also depress worker well-being and require firms to pay higher wages to retain workers. Well-being is covered in more detail by Eugenio Proto (University of Warwick & IZA), who looks at the existing evidence on the link between employee well-being and company performance. Both laboratory studies and real-world findings suggest that not only do better performing companies have happier employees, but happy employees also contribute to better company performance. These findings have several implications for company practice, management strategies and for research. 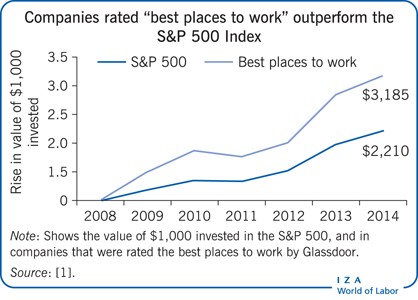 First, if happiness in a workplace carries with it a return in terms of enhanced productivity, there are enormous implications for firms’ promotion policies and for the way they structure their internal labor markets. For example, managers could be rewarded on the basis of employees’ job satisfaction, and workers could be allowed to take a more active part in decision-making, which in general raises job satisfaction. Second, the effect of happiness on productivity raises the possibility of self-reinforcing spirals—potentially even operating at a macroeconomic level. Happiness might lead to greater productivity in an economy, and that might in turn result in greater well-being in the population. Douglas Kruse (Rutgers University & IZA) identifies employee ownership as another mechanism that can enhance company performance by creating closer ties between employee performance and rewards. Employees are effectively “working for themselves,” and by sharing the overall economic “pie” more widely, the incentives of workers and owners can become aligned so that productivity-reducing conflict is minimized and productivity-enhancing cooperation and innovation encouraged. This is particularly so when employee ownership is combined with employee participation in decision-making and other high-performance work practices. 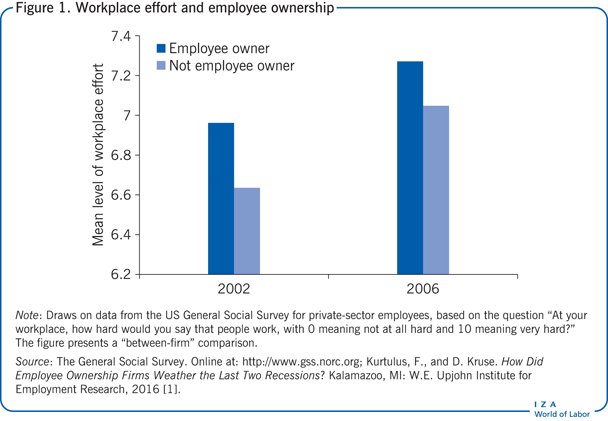 Not only is employee ownership linked to higher company performance on average, but it may also add to worker pay, employment stability, and company survival. While free-rider problems may occur and employees are put at higher financial risk, Kruse outlines ways to overcome these problems. Apart from benefiting companies and workers, the findings point to the potential for employee ownership to increase economic stability and reduce unemployment and inequality in the overall economy.